Choline is one of the most basic supplements that I recommend to my patients and I do it for a variety of reasons. Choline is considered a bile salt and it plays a pivotal role in the digestion of fats. These bile salts act as an emulsifying agent and break fats into fatty acids. Without a steady stream of fatty acids in our body we set ourselves up for a variety of neuro-degenerative disorders like Parkinson's, Alzheimer's, and MS. The research is extensive on this nutrient and its health benefits cover almost every disease process known. The reason for this is that Choline is great for thinning bile and getting these salts to break up areas of congested tissue all throughout the body. The plaque you see in these disease’s is the result of the congested material getting stuck and then drying out. Choline is the most abundant salt in BILE and helps keep bile healthy. This powerful nutrient has been shown to improve many health conditions, including, ALL neuro-degenerative conditions, liver conditions, cognitive performance, fetal development, even glaucoma. 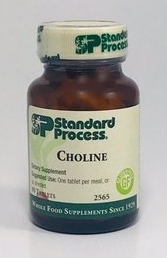 Choline is a fat emulsifier and reduces the surface tension in fat and bile. Choline is one of the salts you will see in healthy bile which allows the body to breakdown fat into fatty acids for the building of the brain. It also breaks down the plaquing that you see from toxic buildup in the brain causing amyloid plaque. We are again back to healthy bile as the universal detergent and crucial element for a healthy nervous system. Our brain, spinal cord and nerves are made mostly of fat. Fat is a great insulator and conductor of the electrical flow of the nervous system. One area you find Choline very useful is during pregnancy for the brain health of the unborn child. Several studies have shown how this supplement helps with the brain development of the child and can improve intelligence. Our livers should be actively making bile salts and they are an important component of the quart of bile our liver is making on a daily basis. Poor food choices over time use up our bile salts and lead to all kinds of digestive problems from acid reflux, gas, and bloating to constipation, irritable bowel syndrome, and diverticulitis. Chloine is very effective in restoring GI tract health and improving digestion. Some of you have felt for yourselves when you don't breakdown fats efficiently. It may have lead you to call my office because of low back pain, shoulder/neck pain, and migraine headaches. Along with an adjustment I probably recommended Chloine or some other digestive aid to help get you out of pain and holding the adjustment sooner. I also routinely recommend a diet high in fruits and vegetables for many reasons. One of the big ones is because the salts in fruits and veggies are perfect for making healthy bile and supplying a constant dose of bile salts.